Up to 500 people have attended a vigil for Mark Duggan outside Tottenham police station. On Wednesday, a jury concluded the 29-year-old was lawfully killed when he was shot dead by police in August 2011, sparking riots in many English cities. The gathering was used to protest against deaths in police custody. His family had called for it to be a peaceful event to remember Mr Duggan. A minute's silence ended with chants of "No justice, no peace". The vigil for Mark Duggan opened with a minute's silence led by his family - including his small children - from the steps of Tottenham police station. 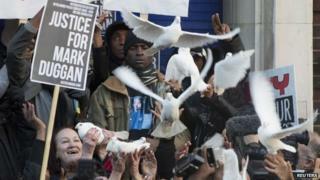 Up to 500 people gathered for the event, many holding placards declaring "Justice for Mark Duggan". They mostly listened attentively as his family and supporters vowed to continue their fight - interspersed with regular supportive chants of "No justice, no peace". The event was also a wider protest against police, with speeches from families of people who died after being in contact with officers. The crowd responded to their stories with cries of, "Who are the murderers? Police are the murderers". The police themselves maintained a low-key but visible presence, with senior officers listening on from within the crowd. The Rev Nims Obunge, who conducted Mr Duggan's funeral, closed the vigil by calling for peace in the community, before his family released doves into the freezing skies. Mark Duggan's aunt, Carole Duggan, who said before the event she wanted "no more violence", addressed the crowd from the steps of the police station. She said: "We have to remember Mark is not the first person to die at the hands of the police. Mr Duggan's mother Pamela also spoke, thanking everyone for attending peacefully outside the police station. She said: "We want justice for my son. "Mark was a young boy. He wasn't a gangster. Gangsters have everything. Mark didn't have nothing. "Mark had his children, his life." The family of Sean Rigg, a black musician with schizophrenia who died at Brixton police station in 2008, also attended the gathering in north London. Nearly 1,000 people have died in police custody in England and Wales over the past 20 years. Of those, more than 100 were black or from an ethnic minority. Trade unionists were also there with banners in what the BBC's Nick Beake called "a broader anti-police protest". Later, members of the Duggan family released white doves into the sky. Image caption Carole Duggan told the crowd: "Mark is not the first person to die at the hands of the police"
Image caption A minute's silence ended with chants of "No justice, no peace"
Ahead of the vigil, the police station's shutters came down with a message on the front saying that the station was closed. The first two people to arrive, bringing chairs with them, were Islington pensioner Anne Johnson, 80, a member of the Communist Party of Great Britain, and 73-year-old Martha Osamor. Ms Osamor, who works at Haringey Law Centre, in Tottenham, said: "I knew Mark Duggan when he was a little boy. So little has changed over the years. "Here am I picketing outside Tottenham police station yet again." Earlier, police said they had been aware of a "small number" of people intending to provoke disorder, despite the family's pleas for a peaceful vigil. The Metropolitan Police said it had a "policing operation" in place across London in case there had been any problems. Tottenham Hotspur's game against Crystal Palace at nearby White Hart Lane kicked off an hour after people started gathering for the vigil. Met Commissioner Sir Bernard Hogan-Howe had already praised the family's "dignified" response to the inquest. Prime Minister David Cameron welcomed Ms Duggan's message of restraint, saying: "I very much respect Mark Duggan's aunt for saying 'pursue the case in the courts and not the street'." In Birmingham, about 30 people also gathered as part of a similar event. Organiser Geoff Dexter said it had been arranged for those who could not travel to London, to allow them to show support for Mark Duggan's family. People gathered outside Tottenham police station after Mark Duggan was shot in 2011, with anger growing and leading to the worst rioting in a generation. The jury at his inquest concluded after three months that he was in possession of a gun - although not holding one - and therefore posed an imminent threat to police when he was killed.